A boat takes you from property’s marina to the helipad, and then a helicopter takes you to the airport—all in about 15 minutes. Yes, a private jet offers a quick, convenient, and comfortable way to travel from one destination to another. But before you can board your aircraft, you have to get to the airport, and that can be a challenge when you have a home in a city such as Miami. Traffic can make the ride to the plane longer than the flight to your destination. According to Ophir Sternberg, the founding partner and CEO of Lionheart Capital, the development firm behind the soon-to-open Ritz-Carlton Residences, Miami Beach, many of the people who purchased the property’s condos and villas are jet owners and expressed concerns about how long it would take them to get to their aircraft. The answer—now—is about 10 or 15 minutes, thanks to what Sternberg calls “the ultimate amenity.” When the property opens in early 2018, residents—who have paid from $2 million to $40 for their homes—will have access to a so-called “navigable marine helistop.” It’s essentially a large, flat boat that’s moored in Biscayne Bay and serves as a helipad. “You’ll be able to take a five-minute boat ride and then be at any of the area’s airports in about 15 minutes,” says Sternberg. 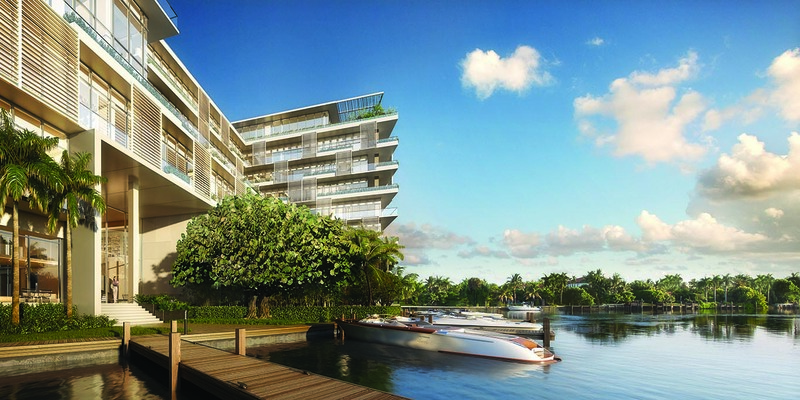 The property, in the Mid-Beach section of Miami, is on a lake that is connected by a waterway to Biscayne Bay. A short ride in the Residences’ Frauscher Lido 1017 day yacht takes you from the property’s 36-berth marina to the floating helipad. There, you board the helicopter that you’ve scheduled through the Residences’ concierge and are whisked off to the airport where your jet is hangared. Miami International Airport is a seven-minute flight from the helipad. Fort Lauderdale–Hollywood International is 15 minutes away, and West Palm Beach International is 30 minutes away. The helicopter service is operated by Miami Executive Helicopters, and the marine helistop belongs to a company called iLand Miami. The helicopter service won’t be limited to airport runs. Residences owners also will be able to use it to fly to Naples (60 minutes), Sarasota (90 minutes), and many other Florida destinations.